Dividend Ninja interviews Dan Bortolotti to discuss index and dividend investing. From my point of view, Dan did a great job of explaining misconceptions many dividend investors have. Some of the dividend investors who commented saw it differently. Preet Banerjee interviews John Robertson who explains how to keep investing simple. Big Cajun Man has some trouble with a CRA request for documentation on expenses for his autistic son. This is a case where CRA shows it has a heart. Canadian Couch Potato interviews Larry Swedroe to discuss challenges new retirees face with their portfolios. Boomer and Echo looks at the various ways we kick debt down the road. We often have the best of intentions for the future, but just for now, we’ll do the easy thing. The problem is that life is only lived right now. When it comes to finances, the definition of “risk” is tough to pin down. We sometimes refer to portfolio volatility as risk, but this doesn’t line up well with what people mean when they talk about stocks or other assets being risky. William J. Bernstein brings us some clear thinking about risk in his 55-page book Deep Risk: How History Informs Portfolio Design, the third of four books in his Investing for Adults series. Looking to history, Bernstein finds four sources of deep risk: prolonged hyperinflation, deflation from severe recessions and depressions, confiscation of assets as in communist takeovers or very high tax rates, and devastation from war. He then looks at the different ways of insuring against these types of deep risk. The author judges inflation to be the most likely source of deep risk and the easiest to insure against. “Your best long-term defense against deep risk is a global value-tilted diversified equity portfolio.” He judges deflation and devastation to be least likely and hardest to insure against. An interesting quote: “Stocks, when looked at through a mathematical lens, become riskier with time; but swap out the math lens for a historical one and you get an entirely different picture.” I think that if the math doesn’t match reality, then you’re using the wrong math. Overall, I highly recommend this short book for those interested in how to protect their wealth from permanent loss. The vast majority of people who need life insurance are best off with term life insurance. Salespeople have tried to sell me permanent life insurance (universal life and whole life), but I never got a good feel for when this type of insurance might make sense. Recently, the Rational Reminder podcast interviewed Glenn Cooke, an expert in insurance who communicates very clearly. Glenn’s explanations allowed me to understand when permanent life insurance may make sense. Before launching into my take on Glenn’s explanations, let me be clear that Glenn may not fully agree with me. In particular, he might find that the conditions I set out below are too narrow. You have maxed out both your RRSP room and your TFSA room. You definitely have more money than you’ll ever need, and you want to leave a legacy (which might include cash to pay off capital gains taxes on a property, such as a cottage, that you want to stay in the family). You are satisfied that the tax advantages of permanent life insurance outweigh its high fees so that the insurance will likely outperform investments you make in a taxable account. 3. If you’re in the position of wanting to grow your legacy as large as possible, all that matters is whether some form of permanent life insurance is likely to outperform other investment options. I’d have to study the details of a universal policy to form an opinion on whether its tax advantages outweigh its high fees. Some people might argue that condition 2 on its own would be enough to justify buying a universal life policy. Glenn says he has such a policy because he wants to “guarantee there’s an estate there for my kids.” However, if you’re actually running out of money, you’re likely to “cash in” a permanent life insurance policy, so I don’t see any guarantee that the kids will get much money. In fact, if using RRSPs and TFSAs produces better returns than permanent life insurance, then you’re less likely to spend your assets down to zero. I’m satisfied that permanent life insurance never made any sense for my family. If I were helping a family member or friend with life insurance, I would use the three conditions above. But I’m open to changing my mind if I learn more about life insurance. The Canada Pension Plan (CPP) is set to start expanding in January 2019. Workers will begin contributing more of their pay to CPP, and those who contribute more will ultimately receive increased CPP benefits. There are sensible arguments for and against this change, but the most common argument I hear against it makes no sense at all. I saw a version of this bad argument in an article by Charles Lammam at the Fraser Institute calling on Doug Ford to opt Ontario out of CPP expansion. Lammam calls CPP expansion “unnecessary” because “most Canadians adequately prepare for retirement.” He then goes on to quote statistics on the total dollar amounts Canadians have saved in different asset classes. All this proves is that, on average, Canadians have enough savings for retirement. But averages are irrelevant in this discussion. Consider two sisters heading into retirement. One sister has twice as much money as she needs and the other has nothing. On average, they’re fine, but individually, one sister has a big problem. CPP expansion is aimed at those who can’t or won’t save on their own. It’s tempting to ask why we should worry about those who refuse to help themselves by saving for retirement. There are numerous government programs that send tax money to low-income seniors. Three are the Guaranteed Income Supplement (GIS), the Age Amount Deduction, and the Senior Homeowners’ Property Tax Grant in Ontario. As a society, we’ve sensibly decided we don’t want to see seniors begging for food in our streets. An expanded CPP forces more Canadians to save for themselves rather than rely on free tax dollars in retirement. So, why do we force all Canadians to contribute to CPP when it’s only a minority who won’t save on their own? If CPP were optional, too many of those who need it most would opt out. The only way CPP can serve its purpose well is if it’s mandatory for everyone. Lammam complains that “Forcing Canadians to contribute more to the government-run pension will simply reduce the amount they save in private voluntary savings vehicles, resulting in little to no overall increase in total savings.” Good. We’re not expanding CPP to get everyone to save more. We just want everyone to save the bare minimum. It’s perfectly sensible for those who are saving well to reduce other savings somewhat and rely more on an expanded CPP. It’s possible to have a sensible discussion about the merits of expanding CPP. But we should see arguments based on total savings of Canadians or average savings for what they are: a distraction from more meaningful discussion. Many investors love Canadian dividends because they come with a tax break called the Dividend Tax Credit (DTC). Others look a little deeper and say that the DTC just prevents double taxation because the companies paying dividends already had to pay tax on their profits. They conclude that dividend income is no better than interest income, at least from a tax perspective. However, comparing the DTC to capital gains taxes gets more complex. Suppose a company earns one dollar in profit per share, pays 27 cents in income taxes, and pays the remaining 73 cents in dividends to each shareholder. Canadian shareholders actually declare the full dollar as income (called the dividend gross-up), but they get to deduct the 27 cents from the taxes they owe. The idea is that the total tax paid by the company and the shareholder is the same as if the shareholder had received a dollar of regular income. In truth, the numbers don’t work out quite this perfectly. But the DTC does give Canadian shareholders a tax break that mostly covers the corporate income taxes. Most investors don’t think about the corporate taxes paid and just focus on the tax they pay on the dividends they received. Ontarians in the 53.53% tax bracket pay 39.34% on their eligible dividends. Those in the 20.05% tax bracket actually pay a negative tax rate on their eligible dividends (-6.86%). Critics of dividend cheerleaders point out that dividends aren’t taxed any less than interest income once you properly account for corporate taxes. These critics are right. Thanks to reader Garth who pointed me to more detailed explanation of dividend and corporate taxes than I gave above. This doesn’t mean that dividend-paying stocks are no better than fixed-income products. Taxes aren’t the only consideration. A company’s shares may appreciate even if it doesn’t retain any of its earnings. So, future dividends may be larger than interest payments on a fixed-income product even if neither type of income has a tax advantage. Of course, a company’s share price and dividends can go down as well. Dividend cheerleaders look foolish when we compare dividend taxes to interest taxes, but what happens when we compare dividends to capital gains? To me, this is the more relevant comparison. Those who prefer dividend stocks to fixed income products can point to dividend growth as an advantage even if there is no taxation advantage. But when we compare stocks with different levels of dividends and capital gains, the tax difference is important in taxable accounts. Suppose we are choosing between two baskets of stocks, both expected to earn a compound average return of 5% per year. We expect the dividend stock basket to pay 4% dividends and earn 1% capital gains. We expect the other basket to pay 2.5% dividends and earn 2.5% capital gains. So, the only difference is that with the dividend stocks we trade some capital gains for more dividends. For both baskets of stocks, the companies have to pay corporate taxes, so we can just leave them out of the comparison. Now dividend cheerleaders don’t look so foolish for ignoring corporate taxes. For any money we withdraw to live on each year, we can just compare dividend tax rates to capital gains tax rates. In Ontario, dividend tax rates look better when our total income is under about $95,000. But this ignores capital gains deferral. Suppose we spend less than 4% of our savings each year. With dividend stocks, we’d have to reinvest some dividends that we’ve already paid taxes on. With the other basket of stocks, we’d get the advantage of deferring some capital gains taxes to the future when we sell the stocks. Depending on how long we defer the taxes, this can give the capital gains the advantage over dividends down to total incomes as low as $48,000 in Ontario. Note that with the dividend gross-up, our actual received income can be even lower than this. If we’re expecting our total income (including CPP and OAS) to be lower than $48,000 in retirement, it may seem like we should opt for dividend stocks. But keep in mind that all of this analysis assumes we have a taxable account. It only makes sense to have a taxable account if your RRSP and TFSA are completely full. This tends to be true only if we have large RRSPs that lead to high income in retirement. So, in most cases, capital gains taxes are lower than dividend taxes. Those who like Canada’s lower tax rate on dividend income appear misguided when we compare dividends to interest income and properly account for corporate taxes. But when we compare dividend taxes to capital gains taxes, it makes sense to ignore corporate taxes and focus on the favourable tax rates for both dividends and capital gains. Index investors in Canada who own Exchange-Traded Funds (ETFs) have a choice to make with their U.S. and international stock holdings. They can either buy an ETF that holds U.S. and international stocks but trades in Canadian dollars (such as Vanguard Canada’s VXC), or they can buy U.S.-listed ETFs that trade in U.S. dollars. This choice is a trade-off between cost and complexity. It’s certainly a lot simpler to own VXC. With U.S.-listed ETFs, you need to find an inexpensive way to exchange Canadian for U.S. dollars, such as Norbert’s Gambit. But, as Justin Bender explained, the cost of VXC is higher than the cost of owning U.S.-listed ETFs. This higher cost comes from a higher Management Expense Ratio (MER) and U.S. dividend withholding taxes. For the mix of U.S.-listed ETFs that I own (VTI, VBR, and VXUS), the blended MER is 0.09%, which is 0.18% lower than VXC’s MER. Less obvious, as Justin calculated, is the fact that U.S. withholding taxes of 0.35% cannot be recovered for VXC. This tax is not charged to VTI, VBR, and VXUS when they’re held in an RRSP. There are international dividend withholding taxes that apply to both VXC and VXUS. From this total of 0.53% in lower costs for U.S.-listed ETFs, we need to subtract the added costs of currency exchanges. In my case, this averages about 0.01% per year using Norbert’s Gambit. However, this cost would be higher for smaller portfolios and much higher for investors who don’t use Norbert’s Gambit. In total, my costs would be about 0.52% higher each year if I owned VXC. I plugged this higher cost into my retirement spending spreadsheet and found that my estimated lifetime retirement income derived from my portfolio declined by 5.6%. So, for example, if my portfolio was going to produce $50,000 per year, this would drop by $2800 per year if I owned VXC instead of my U.S.-listed ETFs. Now that I’m comfortable managing a portfolio that includes very infrequent Norbert’s Gambit currency exchanges, I find the added complexity of dealing with U.S. dollars to be worth it for the extra income, but your mileage may vary. Dan Bortolotti answers a question from 60-year old Jerry W. about how he and his wife can generate $35,000 per year from their savings (combined $400,000 in RRSPs and $180,000 in TFSAs). Dan makes a number of excellent points, and concludes with “it would be worth considering whether it makes sense for you to take your CPP benefits before age 65.” We don’t know enough details about Jerry’s situation to make specific recommendations, but most people in this situation would actually be better off delaying CPP and OAS until age 70. It seems counterintuitive, but by shifting some longevity risk to the government, retirees who decide to take larger pensions at age 70 can safely spend more money when they’re 60. SquawkFox explains why you should stay away from credit card balance protection insurance. CBC goes undercover to show that banks will do what they can to get you to buy this insurance. John Robertson reports that there are new options for where to open an RDSP, including a robo-advisor. Big Cajun Man has another angle on the benefits of eliminating debt. I get the feeling that he has debt on his mind. If you’ve ever had someone run simulations of your financial plan, the whole process looks wonderfully scientific. Some software takes your financial plan and simulates possible future returns to see how your plans work out. But what assumptions are baked into this software? Here I use pictures to show the shortcomings of a technique called bootstrapping. With monthly bootstrapping, simulation software chooses several months at random from the history of actual market returns to create a possible future. The simulator repeats this process many times to create many possible futures. Instead of monthly bootstrapping, some simulators choose annual returns at random. Other simulators collect blocks of consecutive years. All these methods have their problems. Here we show the problem with monthly bootstrapping, but this problem applies equally well to annual bootstrapping. For the bootstrapping, I simulated one billion 30-year returns. For each rolling period, I just started at a particular month in stock return history and collected 360 consecutive months of returns. To eliminate bias against months near the beginning and end of the historical data, I used “wrapping,” meaning that some 30-year periods began near the end of the historical data and wrapped about to July 1926 to complete the 30 years of returns. So, while there were a billion bootstrapped returns, there were only 1107 rolling returns. This is part of the appeal of bootstrapping; you can create as many different possible futures as you like. The following chart shows what the distributions look like. The distribution of rolling returns is very coarse because there are so few of them available in our stock market history. The bootstrap distribution also has bars, but they are so fine, we can’t see them. The big thing to notice is that the two distributions don’t match well at all. Both curves have the same area under them, but historical returns are more bunched near the center. 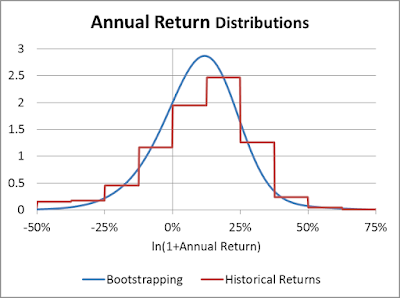 In fact, the rolling period results were within one percentage point of the mean return 47% of the time, but the bootstrapping results were within one percentage point of the mean only 28% of the time. Why is this a problem? Because bootstrapping results are supposed to be realistic possible futures. If bootstrapping results don’t look much like the past, what makes us think they are a realistic model of the future? Much of the theory of finance is built on a foundation of thinking in terms of annual returns. I repeated the process above for annual returns rather than 30-year returns. 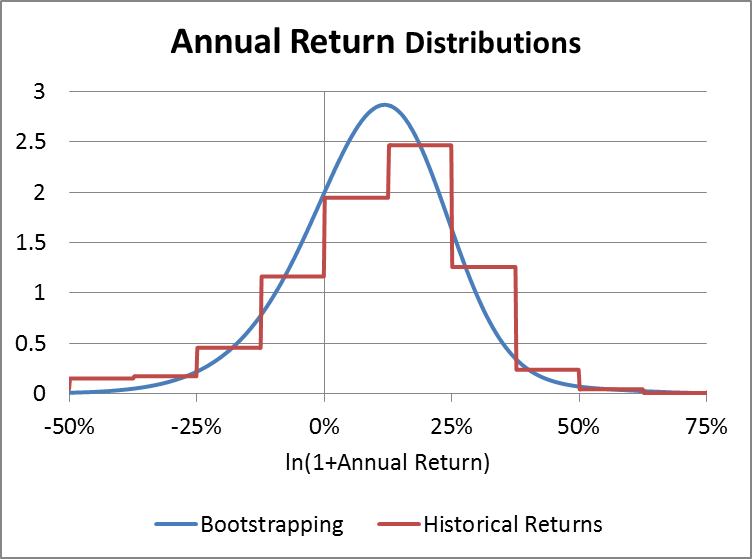 The next chart compares the bootstrapping and rolling distributions. This time, the distributions match reasonably well. Someone who looks at just this chart could be forgiven for thinking that bootstrapping matches reality. But the small difference shown in this annual chart grows to the large difference we saw in the earlier 30-year chart. 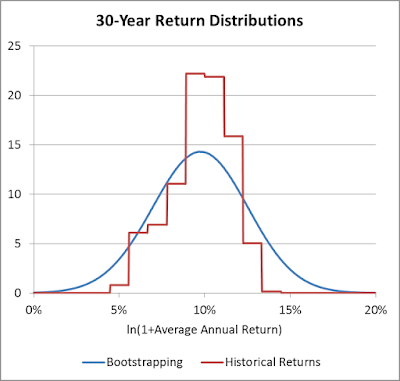 Some will defend bootstrapping and claim the difference shown in the 30-year distribution chart isn’t enough to negatively affect portfolio simulations. This isn’t true. 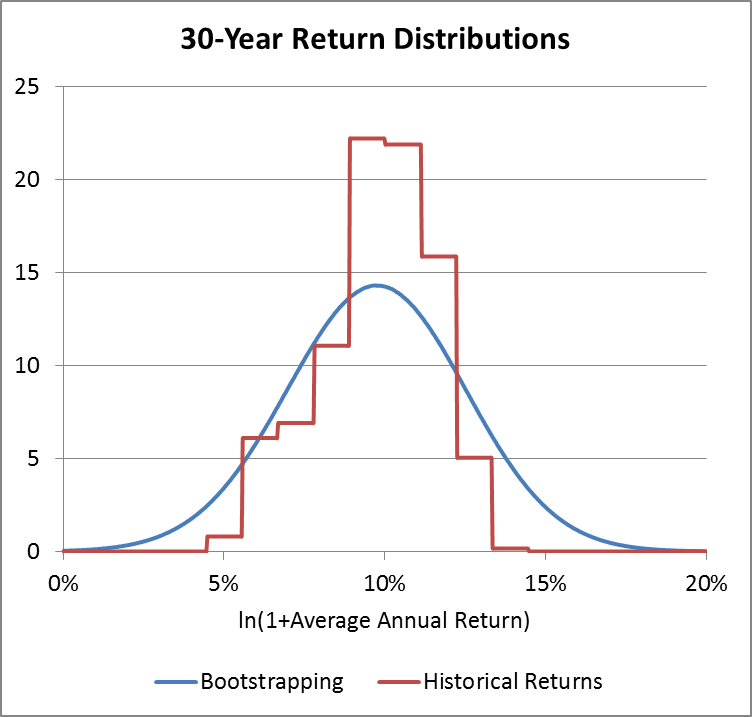 Actual 30-year returns are much less volatile than bootstrapping says they are. Testing financial plans with bootstrapping pushes people to higher bond allocations at too young an age. What accounts for the difference we see in the 30-year distribution chart? It turns out that stock returns from one year to the next have correlations that bootstrapping eliminates. After stocks have had a good run, there is a tendency for them to have a below-average year. Similarly, stocks tend to have a good year after a poor run. This effect is too weak to exploit with market timing, but it does build up over the course of decades. Does this mean we should be doing simulations using returns from rolling periods? Perhaps, but this method has its troubles too. There just aren’t enough rolling periods in history to draw statistical conclusions. The future likely won’t look exactly like any one period from the past. But this isn’t an excuse to use bootstrapping. Actual returns show correlations over time. Bootstrapping strips away these correlations. There is a good quote William J. Bernstein attributes to Ralph Wagner about returns being like “an excitable dog on a very long leash.” For our purposes, the dog’s owner represents the collective fundamentals of U.S. businesses, and the dog represents stock prices. Fundamentals have volatility, but not as much as stock prices. Over one year, the dog can take you anywhere. The longer you own stocks, the more your returns follow the owner rather than the dog. We’re all still affected by the dog’s wanderings, but bootstrapping is like cutting the dog’s leash and letting it run wild. None of this is any guarantee that stock market returns will take you where you want to go. There is no perfect way to peer into the future. Simulations that use bootstrapping have the appearance of scientific rigour, but their outputs have more decimal places than anyone can reasonably justify. It’s widely believed that over 30-year periods, stocks have always outperformed bonds. However, recent research says this isn’t true. U.S. bonds beat stocks over the 30 years ending in 2011, and it happened many times in the 1800s according to retired professor Edward McQuarrie at Santa Clara University. However, the important question is what should we do with this information? Jason Zweig at the Wall Street Journal reported on this research in his 2018 Nov. 2 article Sometimes, It’s Bonds For the Long Run, a play on the title of Jeremy Siegel’s excellent book Stock for the Long Run. It’s doubtful that Zweig is recommending that investors consider whether bonds are the best source of long-term returns, but his readers could be forgiven for thinking this. The next chart shows McQuarrie’s data on 30-year rolling periods. This means that the return shown in a given year is actually the average returns over the previous 30 years. So, near the end of the chart where it shows the bond return higher than the stock return, this means that bonds beat stocks from 1982 to 2011 (by a whopping 0.15% per year). It’s hard to get much of a feel for this information when we talk of average returns. So, let’s switch to dollars. Suppose an investor makes two equal-size investments in stocks and bonds, and lets them ride for 30 years. At the end, what is the ratio of the ending value of the stocks to the ending value of the bonds? The next chart shows this. Consider our hypothetical investor who made two equal investments in stocks and bonds from 1982 to 2011. If the bonds had finished at $100,000, the stocks would have finished at $95,900. If we repeat this experiment for any other 30-year period in the past century, we get a much different story. The most extreme case is 1942 to 1971 where if bonds ended at $100,000, stocks ended at $2,130,000! 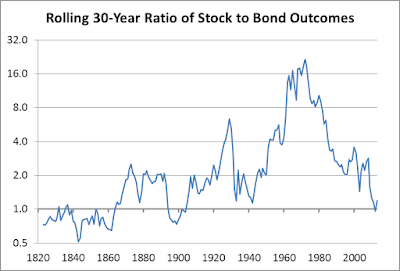 For all 30-year periods ending between 1948 and 2001, stocks always more than doubled bonds. The older data tell a different story. 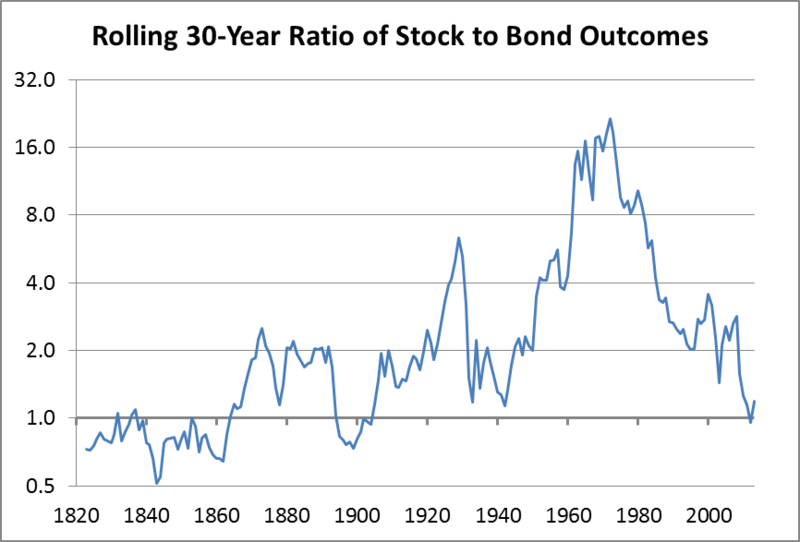 During much of the early 1800s, bonds beat stocks over 30-year periods. Most of the time, stocks lagged by less than 1% per year, but there was one period where bonds outperformed by a cumulative 94%. That would have been a good time to own bonds, but it’s nothing close to the dominance of stocks during most of the past century. Zweig warns that history may repeat itself, possibly “in a way that investors who have all their money in stocks should hedge against before it’s too late.” Unfortunately, while hedging improves worst-case returns, it hurts long-term expected returns. Perhaps Zweig's warning is at least partially a commentary on how the bull run in stocks since 2009 has to end in a crash at some point. So, what should investors do? Should we be increasing our portfolios’ bond allocations? Should we be ready to switch to bonds if we see a repeat of the conditions that led to bond dominance in the early 1800s? For my own portfolio, my answers to the latter two questions are no and no. I already have sufficient fixed income in my portfolio. Nothing has changed. 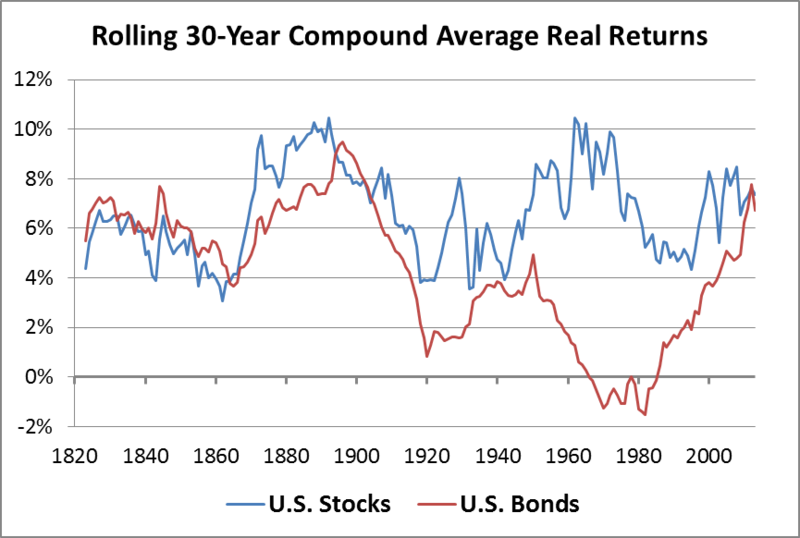 Stocks are a better bet than bonds over the long run. Bond allocations remain a useful way to control a portfolio’s volatility. For any money I won’t need for a long time, I’d rather ride out stock market volatility than give away expected returns by owning bonds. Your mileage may vary. Joe Pinsker has a very interesting article about lowering spending by increasing the pain of spending. In the end, I’m suspicious that making yourself feel pain about all spending isn’t sustainable. Somehow we need to feel fine about sensible spending and feel pain for dumb spending. Condo Essentials has a list of signs that will allow you to spot a bad condo before you buy it. I’m not a big fan of buying overpriced condos, but you should at least check for these problems before diving in. Canadian Couch Potato compares bond ETFs to GICs for retirees. Big Cajun Man explains why you might want to open an RESP for your disabled child instead of using an RDSP only. Boomer and Echo review Larry Bates’ new book, Beat the Bank: The Canadian Guide to Simply Successful Investing. The Smith Manoeuvre is a tax-efficient way to borrow against your home to invest more in stocks. This increases your potential returns, but also increases risk. Periodically, it makes sense to evaluate whether you can handle the potential downside. It’s clear that if you can follow the Smith Manoeuvre plan through to near retirement without collapsing it at a bad time, you’ll end up with more money than if you hadn’t borrowed to invest. The important question is how likely you are to be forced to sell stocks to pay your debts at a bad time. It’s easy to decide you’re safe without really considering the risks. I find that employees, particularly in the private sector, underestimate the odds of getting laid off. Most of the time, they’ll say it can’t happen. But it can. You can lose your job, stocks can fall, real estate prices can fall, and all 3 can happen at once. In fact, a single event could trigger all 3 bad outcomes. Anything that could cause stocks to drop 30% could easily cause sky-high Canadian real estate prices to drop significantly as well. The resulting pressure on businesses could lead to layoffs. This isn’t a prediction; it’s just one possible outcome out of many. This raises the following question. Could you keep your financial plan going if the total value of your house and stocks dropped below your total debt at the same time as you’re unemployed for a few months followed by employment at a lower salary? A gut feel isn’t really an answer to this question. A real answer comes from looking at numbers, including your essential spending, available cash, and the amount of reduced cash flow. If your answer is that you couldn’t survive a scenario like this without selling stocks or your house to make payments on your debt, then you should consider reducing your leverage now (which is just a fancy way of saying you should sell some stocks now to pay off some debt while stock prices are high). If your answer to this question is that you’d be fine in this scenario, or at least you could come out of it with minimal damage, then good for you. If your answer is that such a bad scenario can’t happen, then I wish you luck because it did happen in the U.S. in 2009. One starting point for improving your personal finances is to look at what doesn’t work. This is the approach Laura J. McDonald and Susan L. Misner take in their book 10 Ways to Stay Broke Forever. The authors offer many suggestions for changing negative spending habits, but the book also contains a number of parts that make me question the authors’ numeracy. Positive aspects of the book include discussions about cars. Rather than leasing, if you save up before you need a car “you could go buy that sweet ride outright, with cash.” Another section has some creative ideas for carless alternatives. One piece of advice I don’t agree with is to “Buy instead of rent” your home. Too many young people are digging themselves big holes and would be better off renting until home prices are more affordable. In one baffling section, the authors steer readers to investing “with your friendly neighbourhood bank.” “The personal financial representatives at the bank are trained to help beginner savers and investors understand their options through the use of plain language and straightforward advice.” Either that or they’re heavily-pressured salespeople steering their customers into ridiculously expensive mutual funds. There were several parts of the book that had me questioning the authors’ numeracy. They claim that Total Debt Service Ratio (TDSR) is also known as “Debt-to-Income Ratio.” It isn’t. TDSR is the payments you have to make on your debt divided by your income, not debt divided by income. Typically, to get a mortgage, your TDSR must be below about 40%. Knowing this “it might shock and appall you to learn that the average Canadian household’s debt-to-income ratio is a whopping 163 per cent. So, yeah, this is a problem.” Because these are different measures, comparing the 40% TDSR limit to the 163% debt-to-income ratio is meaningless. A survey “found that 61 per cent of Canadians believe they have less debt than the average Canadian. Since that is statistically impossible, it seems we might have just found our common national characteristic: debt denial.” It’s not statistically impossible. In fact, their next paragraph includes “the average credit card debt is $3277.33. Forty-one per cent of Canadians have credit card debt of more than $3,000.” So, 59% have credit card debt under $3000, and even more have credit card debt under the average amount ($3277.33). It’s important to understand the difference between average and median. In a list of the components of the purchase prices of a car, the first entry was “Price of your car ÷ monthly payments.” This formula gives some number of months, which obviously isn’t part of the purchase price of a car. Perhaps they meant “payments times number of months.” It’s bad enough that someone wrote this, but apparently all the book’s proofreaders either didn’t see it was wrong or just glossed over anything that looked mathematical. A “BMO report found that 43 per cent of Canadians sometimes spend more in a month than they earn.” That sounds bad until you try to figure out what it means. I sometimes spend more in a month than I earn. Over the years, I’ve paid for a pool, a deck, new windows, new flooring, a new fence, and other big-ticket items. In each case I spent more that month than I earned. I’m willing to bet that 43% should actually be over 99%. So what was this statistic actually measuring? Your guess is as good as mine. These innumeracy problems may not affect the bulk of the book that is intended to give people practical ideas for breaking out of self-destructive spending patterns. However, when I see authors get things like this so wrong, it makes me doubt other parts of the book. Many things I already knew, but how much trust should I put in the parts I didn’t already know? I can’t recommend this book.